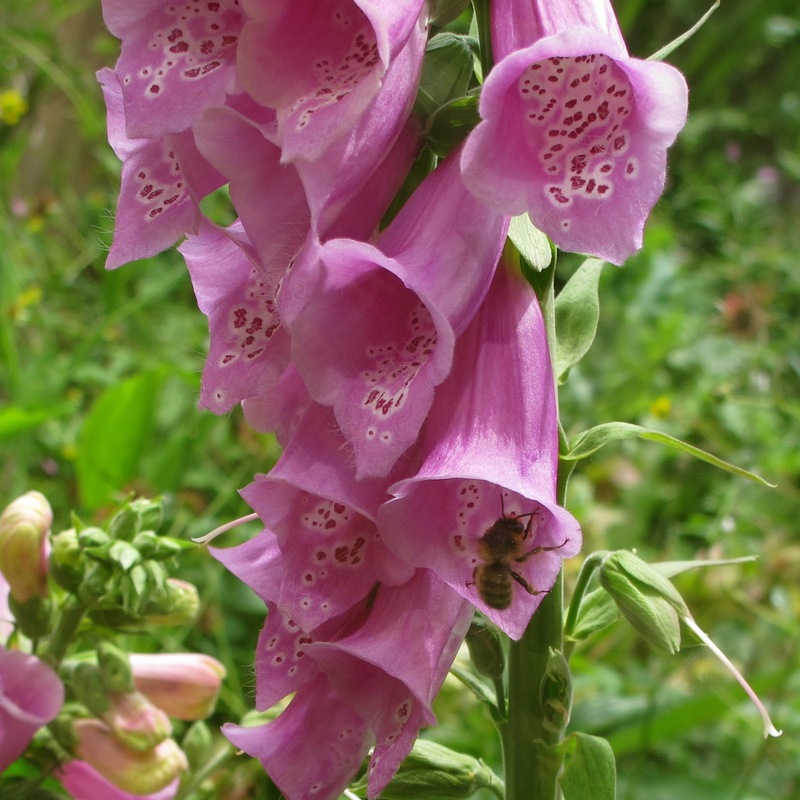 June is peak Foxglove, Digitalis purpurea, season. This year, we have quite a few in the garden, and luckily one of them faces the conservatory, which allows me to observe visiting bees quite closely. Today I watched the bees feeding on it in sunny spells between showers. 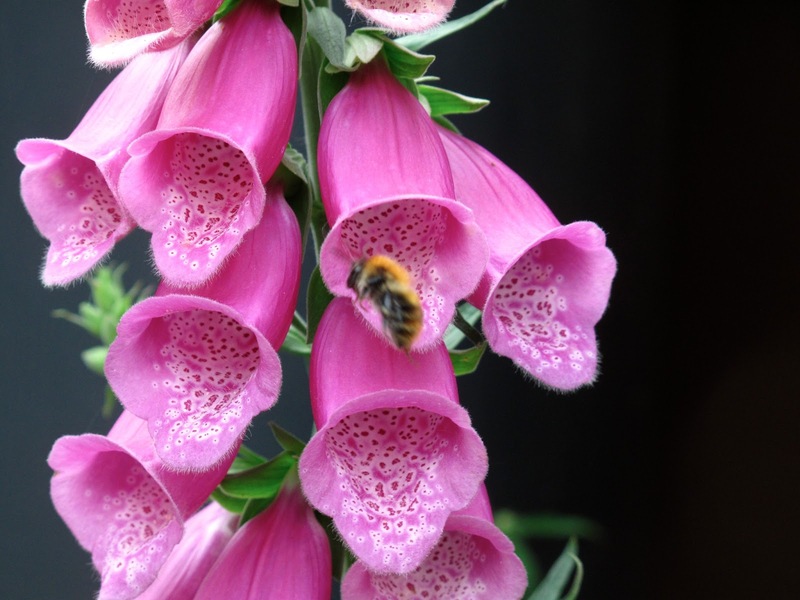 Foxgloves are said to be adapted to be pollinated by bumblebees: they have large, bell shaped flowers with a large landing lip and hairs that might deter smaller bees or other insects from entering. Indeed, bumblebees, and particularly long-tongue species, can reach the nectar deep inside the flower and actually pollinated it are the main visitors. A study in N Yorkshire found that Bombus hortorum (top, individual leaving flower with pollen load, and another individual just visible inside a lower flower) was the main visitor and preferred this flowers when available, but another study in Belgium found that B. pascuorum was the main visitor. The tree bee Bombus hypnorum is also a regular. All three species are commonly found on floxgloves flowers in my garden, with B. hortorum being the most common visitor. But other bumblebees, including those with short tongues do often collect pollen by 'buzzing' inside the flower even if they cannot reach the nectar. 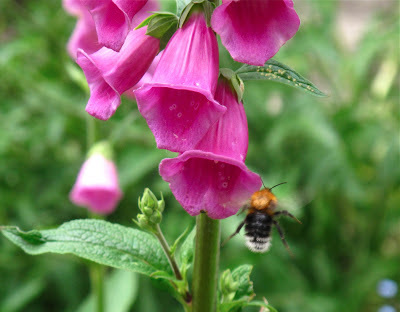 A few solitary bees also visit foxgloves. In my garden the forked tailed flower bee Anthophora furcata regularly visits them, and more rarely the carder bee Anthidium manicatum. 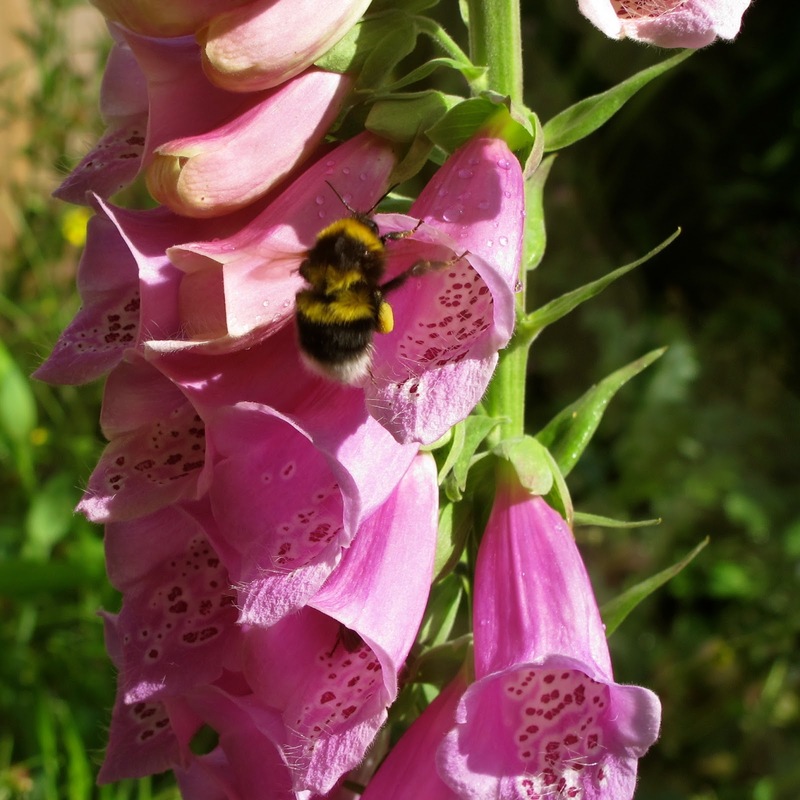 As relatively few species feed on this species, it is a good starting plant to familiarise yourself with bumblebees. Today, I watched four bee species visiting this particular foxglove stem. A male A. furcata (above) jumped on each visiting bumblebee to check them out, but was obviously feeding also on nectar. I haven't seen females around yet. The male has similar size and colour than a honeybee, but it has a bright yellow face and a visibly long tongue. Bombus hortorum is the bumblebee with the longest tongue in the UK (above, with tongue extended). It can also be recognised by its double yellow band formed by the rear of the thorax and the front of the abdomen, and its white tail. B. pascuorum is the most common all-brown bumblebee in gardens. Bombus hypnorum is a very distinctive bumblebee, three coloured: brown/black/white. The stout black abdomen with lateral yellow patches of the Wood Carden Bee Anthidium manicatum which visited on 1/07/2011. 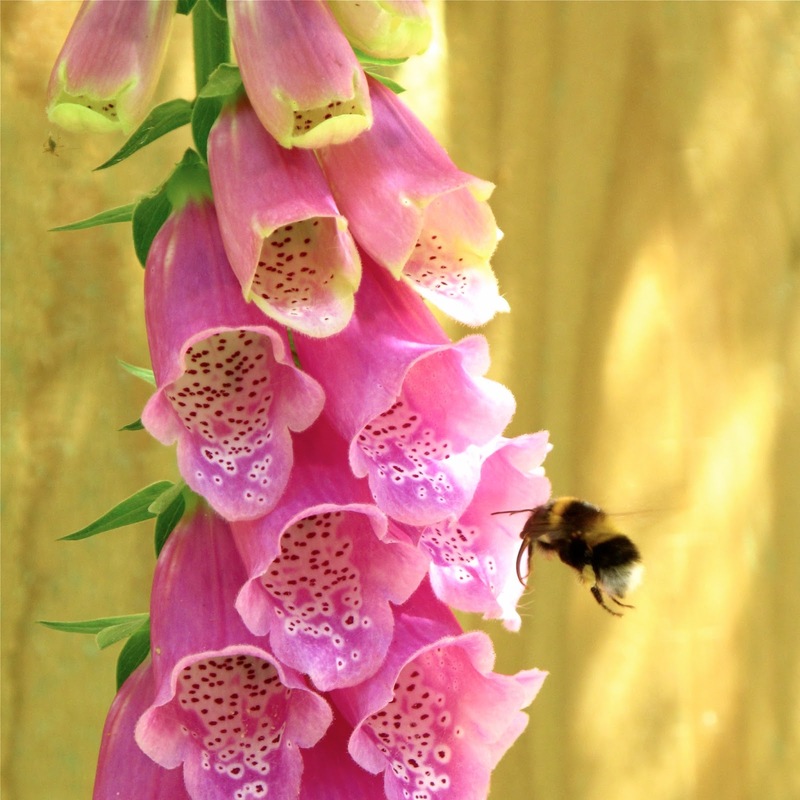 Foxglove flowers open from the bottom of the stem towards the top. The plant reproductive parts are located on the roof of the flower, four stamens and a pistil in the middle, so that the body of a bumblebee entering the flower rubs against them. To reduce self-pollination, the flower anthers open first, delivering a pollen load onto bumblebees feeding. 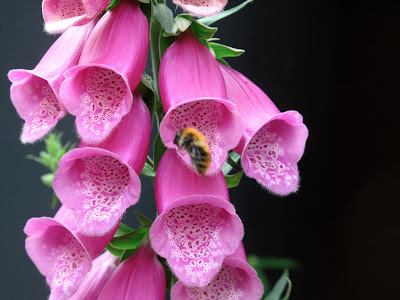 Five days later, when the pollen is likely to be exhausted the pistil becomes receptive, increasing the chances that it will be pollinated by the pollen of a different plant. 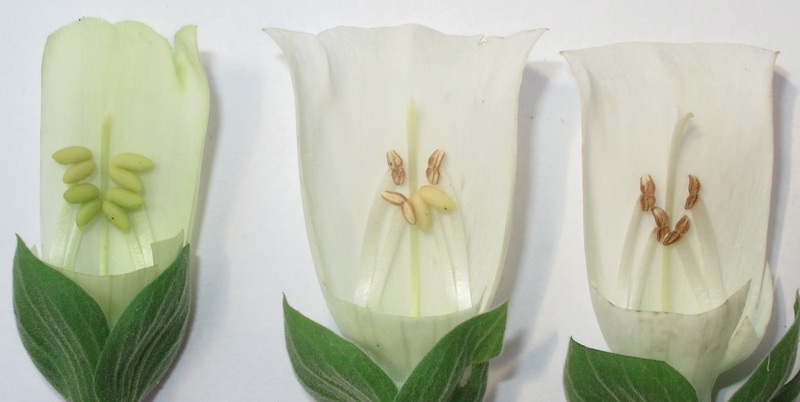 I cut three flowers of a white foxglove in the garden and removed the roof of the flower to expose the reproductive organs. The one on the left, from the top of the flower spike just opened. The lobed yellowish sacs are the closed anthers, and the spike in the middle is the pistil, also closed and attached to the flower roof. The middle flower has open anthers and the pistil, although closed, has started to detach. On the left is the oldest flower from the bottom of the flower spike. 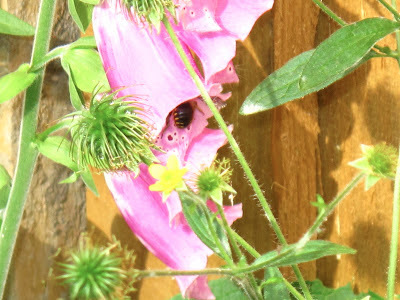 Its anthers are almost devoid of pollen and the pistil is now pointing down, so that is easily rubbed by the bumblebee's back and then ready to be fertilised. A bumblebee view of a foxglove. Note the open pistils on the lower, older flowers. Arthur A. D. Broadbent and Andrew F. G. Bourke (2012). 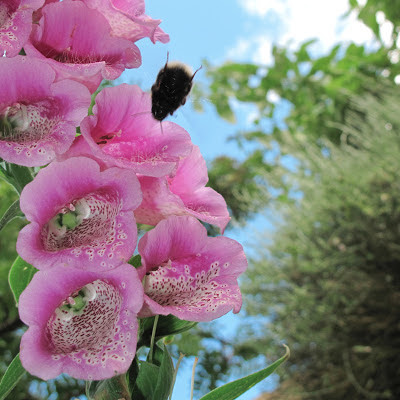 The bumblebee Bombus hortorum is the main pollinating visitor to Digitalis purpurea (Common Foxglove) in a UK population. Journal of Pollination Ecology, 8 (7), 48-51.